The mission statement of Trinity Hospice is: “Compassionate care on the journey to the end of life.”Recognising that this journey is challenging and unique for every individual the Directors and Board of Trustees identified an opportunity to facilitate conversations with patients and carers through the use of commissioned bespoke artwork to be hung in their ecumenical and interfaith Hospice Chapel in 2010. The aim was to create a space that enabled people to reflect, acknowledge and if needed express their complex emotions using the paintings as prompts. To try and devise a series of large paintings in this chapel, which would help those who seek refuge with in it, was a difficult and demanding artistic challenge. In approaching this commission I asked the following questions. What do the staff and carers do in this hospice? What are the patients and loved ones feeling and thinking? What is it to be a human being? I decided to choose the theme of The Dance, inspired by the well-known hymn Lord of the Dance. Each of the oil paintings was of a dancing figure in different poses. All seven paintings reflect different aspects of the experience of living with, or caring for someone with a life limiting illness. A leaflet of reflections is provided that people can use if they wish to help them interpret the paintings.The images can be seen on the BBC website. I am Rev David Shaw the hospice chaplain At Trinity in the Fylde. 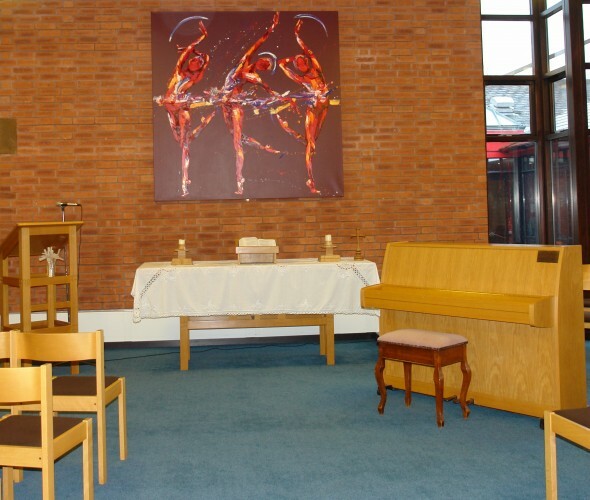 I would simply like to say that I think the paintings in our chapel are beautiful, inspired, powerful, and a very valuable addition to the spiritual life of the hospice. As the future unfolds they will I am sure be an inspiration to many patients and staff. We had the great joy 2 days ago of seeing your paintings in the chapel at Trinity Hospice.We both found them overwhelmingly beautiful and moving, and so full of inspiration and hope. During the last year I have been diagnosed and treated for cancer. I only wish the paintings had been in place throughout the year. We’ve both been in the same place as “Lost” at the low times.Thank God we’ve also known some of the uplift and joy of the journey you depict; mainly through the love and support of friends and the marvellous people who staff the hospital and the hospice services. In all we’ve read and all that has been said to us this year, nothing has encapsulated so well as “The Dance” the message of hope we’ve needed, and still need, to experience. I would like to let you know how I feel about the pictures on the walls in Trinity Hospice.Today is a very sad day, for 13 years ago I lost my much-loved mum. She was 57 and her life was cut short. On this day every year I take that dreaded journey down to the hospice to see my mum’s name Glenis Johnson in the book of remembrance.My mother entered the hospice five times and came home, but sadly the last time her battle was lost. As I sat in the chapel today, thinking about the room around the corner that my mum took her last breath in, I looked upon the walls and couldn’t believe the story the pictures told. The artist Penny Warden has certainly put into pictures the journey of cancer, how it makes you feel, what battles you face, how each day is precious, how you cope and how you protect the ones closest to you. I could have sat there all day, taking in the images and putting my journey with cancer to each and every painting. It’s already beautiful and peaceful at the hospice, but today I left there with a greater understanding.So thank you to the hospice, thank you to Penny Warden, and thank you to my beautiful mum, who I miss every second of the day. Please can you spread the word about what a wonderful experience I had to others, who may just want a place to go and sit, and work out where their journey starts and ends.